LIFE HACKS #2258 AMAZON PRIME IS FREE FOR COLLEGE STUDENTS - ProudMummy.com the Web's Community for Mums. 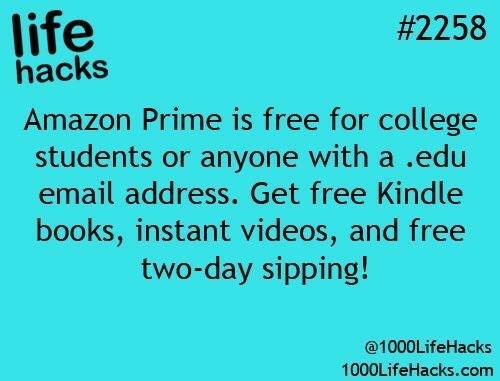 LIFE HACKS #2258 AMAZON PRIME IS FREE FOR COLLEGE STUDENTS OR ANYONE WITH A .EDU EMAIL ADDRESS. GET FREE KINDLE BOOKS, INSTANT VIDEOS, AND FREE TWO-DAY SIPPING!